On November 2, 2015, Supergirl will hit its regular timeslot of 8pm ET/PT on CBS for its second episode. Thursday CBS released the official description of the episode, which sees Supergirl now in her status quo, called "Stronger Together." 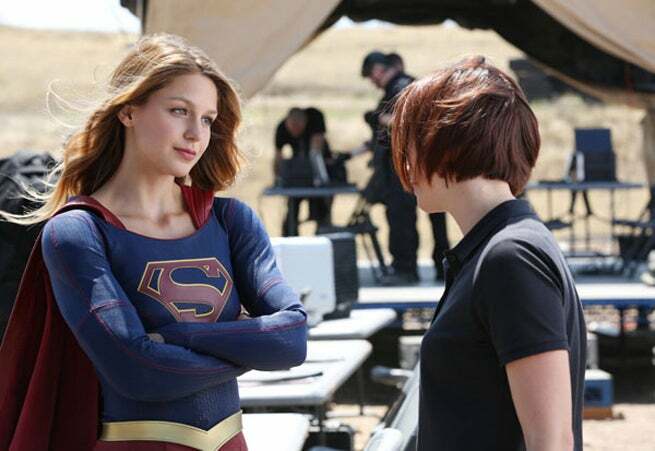 The episode features Supergirl going after an escapee from a "Kryptonian prison," was written by Greg Berlanti, Andrew Kreisberg, and Ali Adler, and directed by Glen Winter. Check out the first image from the episode above, and the full official description of the episode below. "Stronger Together" – When Kara’s attempts to help National City don’t go according to plan, she must put aside the doubts that she – and the city’s media – has about her abilities in order to capture an escapee from the Kryptonian prison, Fort Rozz. Also, Cat pressures James to use his connection to Superman to get her an interview with Supergirl, when SUPERGIRL moves to its regular time period, Monday, Nov. 2 (8:00-9:00 PM, ET/PT) on the CBS Television Network.